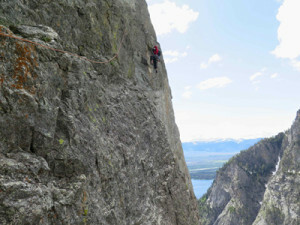 Home Summer in the Tetons – Let’s Go Climbing! 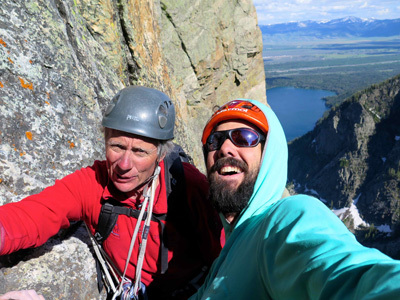 Summer in the Tetons – Let’s Go Climbing! Endless blue skies, longer days, perfect temperatures! That’s early summer in Grand Teton National Park. Many of our summer guides have arrived from recent trips all over the world. They have joined our local contingent for the summer, and when they are not guiding, they are out climbing. We invite you to come and join them. Our guides are the best anywhere! They will assure that you have a wonderful day of climbing whether you’re a first time or experienced climber. The photos below are of our marketing manager/lead guide Brenton Reagan, and technical director/lead guide Tom Hargis, enjoying a great day of climbing together. We still have space available to climb the Grand Teton on a few days this summer. Call us soon to grab your spot before they are all filled.